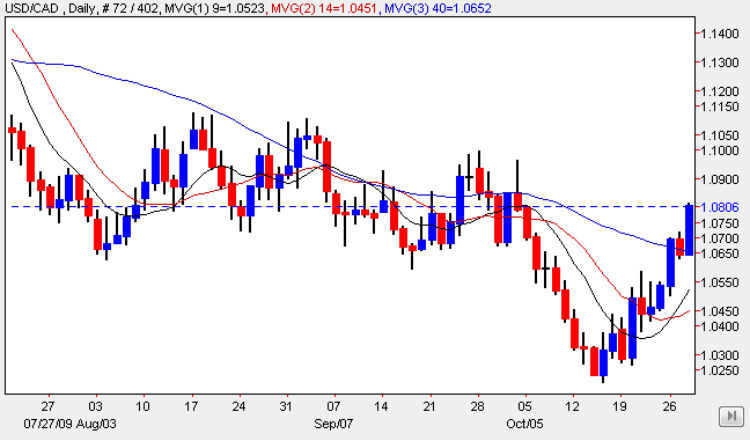 The usd to cad currency pair continued their recovery yesterday, ending the trading session with another strong move higher as investors started buying the US dollar once again, and ending the trading session with a wide spread up candle which found good support from the 40 day moving average, and which also penetrated deep into the resistance area which now sits between the 1.06 and 1.10 price levels. The bullish sentiment now evident in the market is further reinforced by the bull cross signal with the 9 day and 14 day moving averages crossing, and should we see the 1.10 price level breached in due course, then this could provide a solid platform for a significant move higher in due course. All this, of course, is being fuelled by the resurgance of the US dollar over the last few days, althoug it is important to remember that the fundamental picture for the currency remains unchanged, with an ultra low interest rate, a fragile economic recovery there is little prospect of a change in interest rates in the short term. As a result the US dollar remains the low yielding currency of choice for the carry trade, and until this situation changes with an interest rate move, then the fundmanental backdrop remains much the same. In additon it should also be remembered that the US dollar on the USD index, has a host of technical barriers to overcome in order to progress higher, so the recent rally ( whilst welcome ) is far from certain, and hence any trades to the long side should be carefully hedged with suitable stop losses in place. There are only 2 items of fundamental news on the economic calendar for Canada today: the first is the RMPI which measures the change in the price of raw materials purchased by manufacturers and forecast number is -0.5%. This is released at the same time as the IPPI – Industrial Product Price Index which measures the change in the price of goods sold by manufacturers and the forecast is -0.2%. I have covered all the news for the US on the main eurodollar site. You can keep up to date with all the latest fundamental news on the economic calendar, latest currency news and live currency charts by simply following the links. I have also included details on an excellent ECN broker.